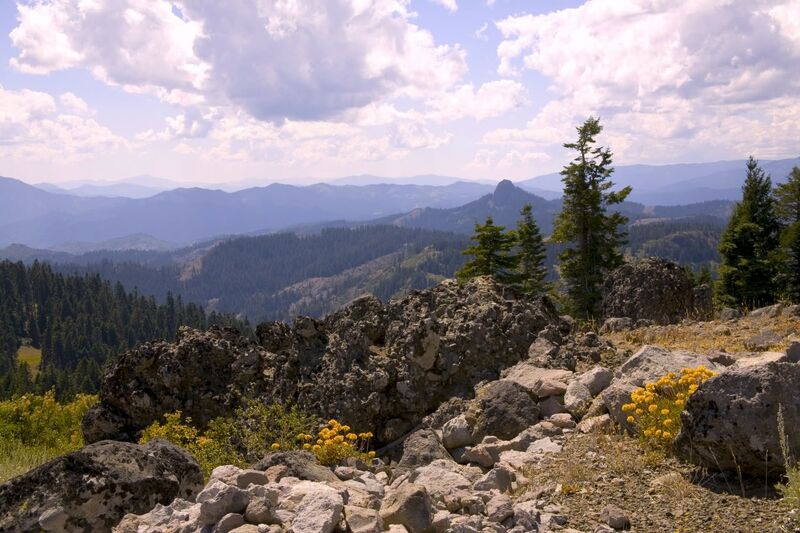 Navigate a gravel road to Paulina Peak—the highest point of the caldera—for a stunning view of one of Newberry's two lakes, as well as the whole Cascade range, from the Sisters to Mount Hood and beyond. I'm an Oregonian, born and raised. I grew up hiking our fern-clad trails, swimming our glacial lakes, and shivering in soggy tents during rainy July camping trips. I know how to identify key native plants, like trillium and Oregon grape, as well as how to apply moleskin. I’ve backpacked the Wallowas, felt the solitude of the Steens, gazed into Crater Lake. 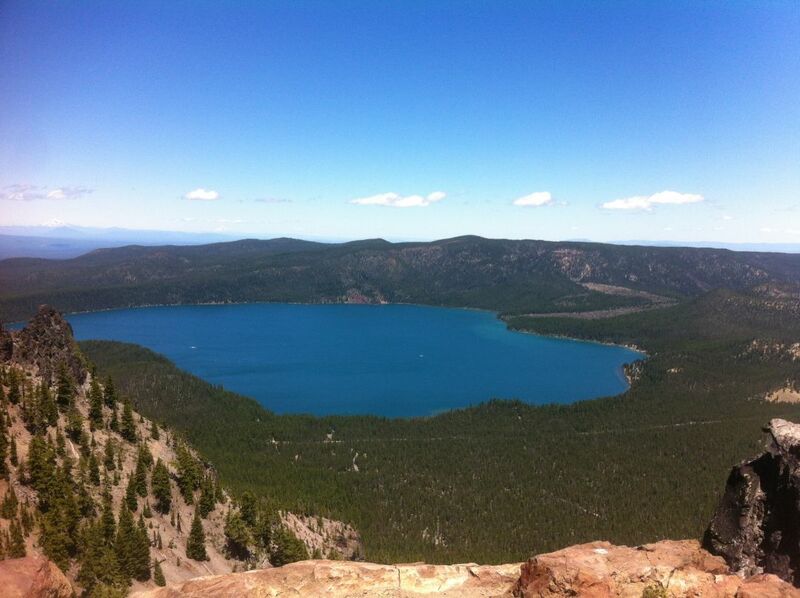 So it’s embarrassing to admit that until very recently, I’d never heard of Newberry Caldera. What’s more, I'd probably still be in the dark, if it weren't for a combination of procrastination and sheer dumb luck. My husband and I planned to go camping over the Fourth of July weekend, but by the time we started looking for a campsite, everything between Mt Hood and Three Sisters was booked. (Side note: remember when you didn’t have to worry about reserving a summer campsite months in advance?) After hours battling the recreation.gov site, I called their reservation desk and asked for anything available around Bend. I wasn't actually laughed at, but there was a “get real” tone in the operator's voice as he told me the next vacant site was in September. But then. Absolutely I was interested. I handed over my credit card and then asked where this cozy hideaway was located. We stayed just 20 minutes from Newberry National Volcanic Monument in this cozy two-bedroom fire guard station located at the dual headwaters of the Fall River. Come Independence Day weekend, the husband and I packed our sleeping bags, water filter, and dog into our Honda and hit the road. It was a little over four hours from Portland to the Deschutes National Forest, where our cabin was located. We got in after dark and because of a mishap with the key, climbed into the cabin through a window. In the morning, refreshed, we woke up to find that we were nestled among ponderosa pines at the icy headwaters of the Fall River. We headed for the caldera—a short drive from the cabin—at leisurely pace. The Newberry National Volcanic Monument was almost Oregon’s National Park, but as you may know, that honor went instead to Crater Lake an hour south. Newberry went federally unrecognized for nearly a century, until it became a national Monument in 1990. But even this prestigious title has not brought in crowds; just 250,000 visitors come each year. 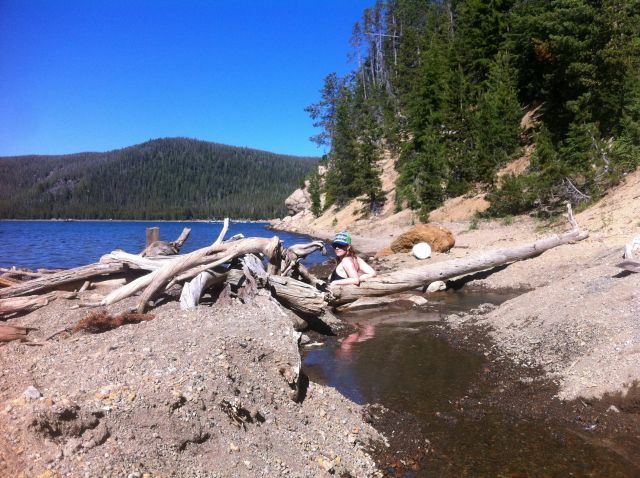 When we arrived at the monument we found it tranquil, encountering few people on our seven-mile hike around Paulina Lake. Parking was plentiful, and unlike National Park trails, dogs were allowed. Newberry is the largest volcano in the Cascade Range, with a 21-mile base and a summit that is estimated to have once stood at 8,984 feet. Though often referred to as the Newberry crater, it is actually a caldera, or a collapsed basin that was formed during a violent eruption about 75,000 years back. (The same is true for Crater Lake—it should really be Caldera Lake.) The most recent Newberry eruption was just 1,300 years ago and formed the Big Obsidian Flow, a cascading mountain of silicic rock that cracks and scrapes like broken glass shards under hiking boots. The one-mile trail through the glittering, black flow is so sharp that it should be avoided by dogs, those with poor balance, and anyone in sandals. 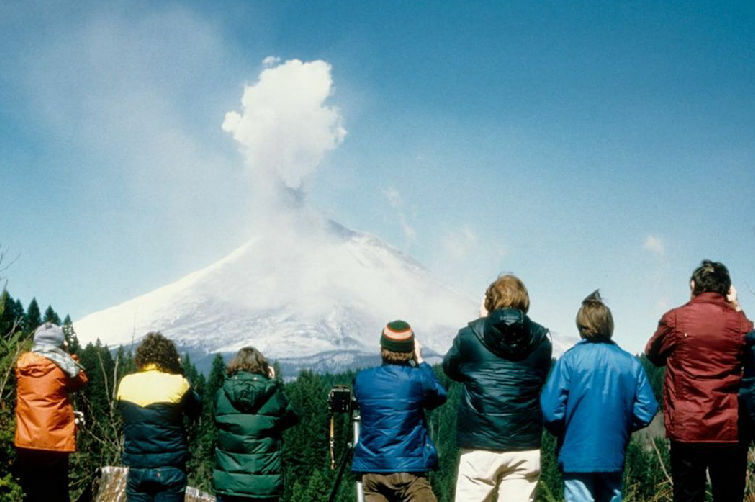 Such a recent eruption means that Newberry is a high threat volcano. 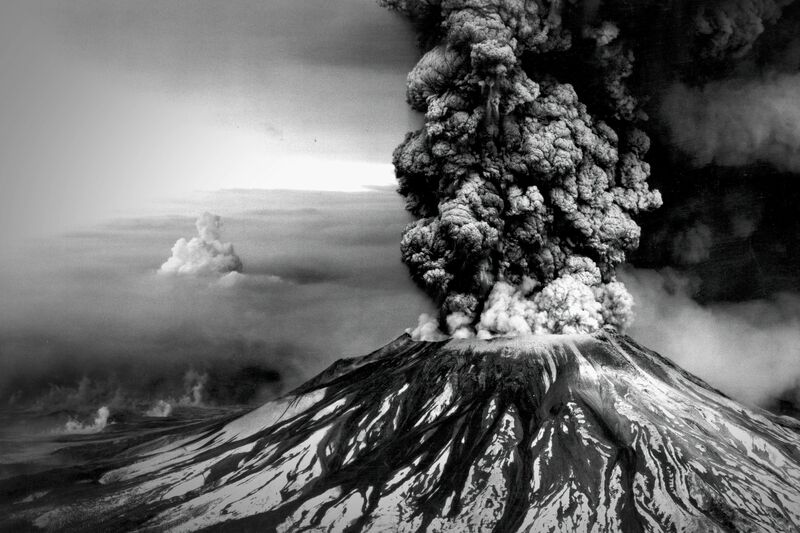 Much like the Cascadia Subduction Zone, it’s not a matter of if, but when Newberry will erupt again. Magma still churns below Newberry’s surface as evidenced by gas emissions, small earthquakes, and numerous hot springs on the banks of Paulina and East, the monument’s two lakes. We visited the Paulina hot springs first, stopping off during our hike around the lake’s perimeter. A number of hot springs bubble up right on the banks of East Lake—accessible by kayak or a foot scramble along the shoreline. Here, we found a manmade channel about a half-mile from the East Lake boat launch. Shovels and thoughtfully arranged driftwood made for easy soaking. Fishermen and campers maintain the springs, which are simple dugouts in the sandy lakeshore contained by driftwood stacked like Lincoln Logs. Bathers come by foot or kayak, soaking in the hot springs and then jumping into the adjacent lake to cool down. Bliss, but also a bath for those camped at Newberry’s primitive campsites. (Think vault toilets and no showers.) We lay in the springs and worked on our tans while watching bald eagles and osprey effortlessly pluck German browns and kokanees out of the lake—much to the consternation of a nearby fisherman who had been at it for a while with no bites. We drove up to Paulina Peak one morning, the highest point of the caldera at 7,984 feet. From this lofty vista point the Cascade Range is laid out in a dramatic string of white-caps, including Bachelor, the Three Sisters, Broken Top, Hood, Jefferson, and—on exceptionally clear days—both Shasta and Adams. Pups are good to go anywhere in Newberry EXCEPT for the foot-snagging Big Obsidian Lava Flow Trail (and maybe those lava tubes). 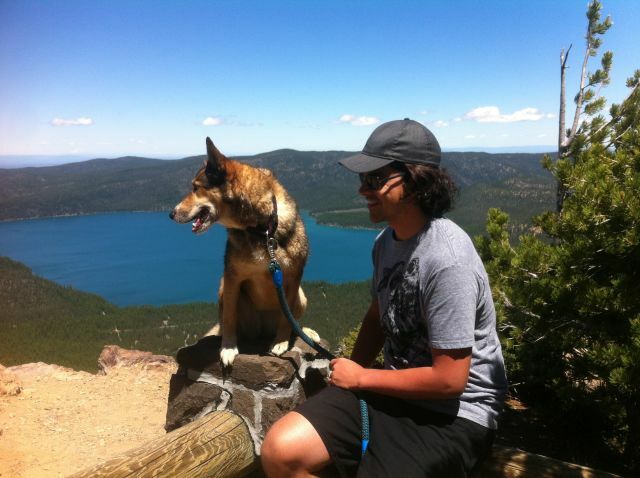 Here, our German Shepard/Husky mix Negu enjoys the view from Paulina Peak. Though we spent most of our time at the lakes, Newberry offers intrepid explorers much more than a nice soak. In fact, this unseen destination boasts a wider variety of volcanic features than any national park or monument in the United States—even more than even Yellowstone. You can face your claustrophobia issues spelunking in the state’s longest lava tube (almost a mile long), tromp up a 500-foot cinder cone, and spy mammoth tree casts formed when lava overtook an old-growth forest. Honestly, there was too much too see in three short days, but now that I know that Newberry exists, I’ll surely be back. Newberry National Volcanic Monument is located 23 miles south of Bend in the Deschutes National Forest. 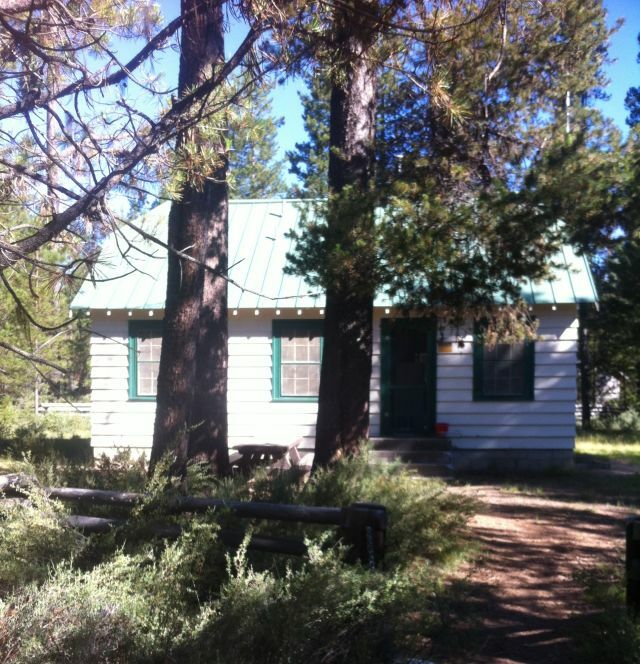 Paulina Lodge Cabins: start at $110 a night. Cabins are located right next to Paulina Lake, with access to kayak rentals and more. Paulina Lake Campground: lakeside sites are $18 a night. Vault toilets and water access.